Concern always arises in cold periods over winter about the effect of the low temperatures on alfalfa winter survival. This is of concern because certainly the alfalfa plant will die if exposed to cold enough temperatures. Alfalfa can survive temperatures of 10 to 15°F. This is the temperature of the crown not the topgrowth. As little as 4 inches of loose snow will insulate against up to 16°F of air temperature. The crown is insulated by soil as well; therefore the crucial temperature is the temperature at 2 to 4 inches below the soil surface. 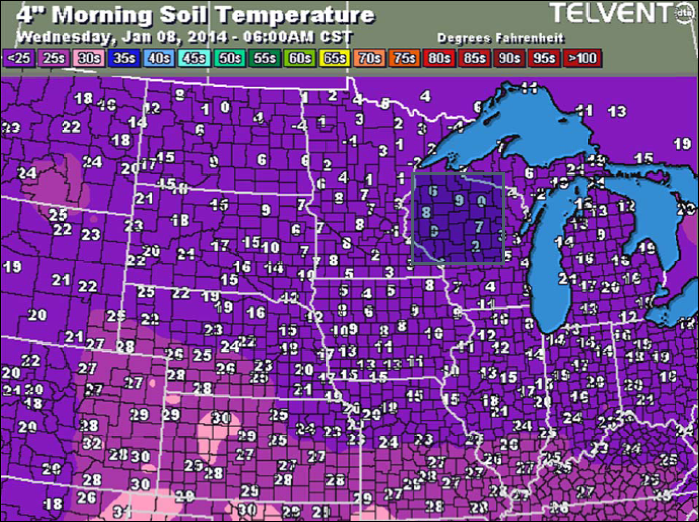 As the map shows, the soil temperature of bare ground at 4 inches on Jan 8 (after the last cold spell) is generally in the single digits above 0°F for the Midwest. The higher temperature than the air the last few days is due to the insulating ability of the soil. However, soil temperature at 2 to 4 inches under the 4 or more inches of snow is generally 28 to 30°F; well above the temperature likely to cause injury to alfalfa. This situation should indicate little to no injury or kill of alfalfa from the recent cold spell.